the top two are 'vintage' fabrics I was gifted... I just love those little bunnies and squirrels... I put some white towelling on the back which makes them that little bit more absorbent. I just need to put snaps on them now. 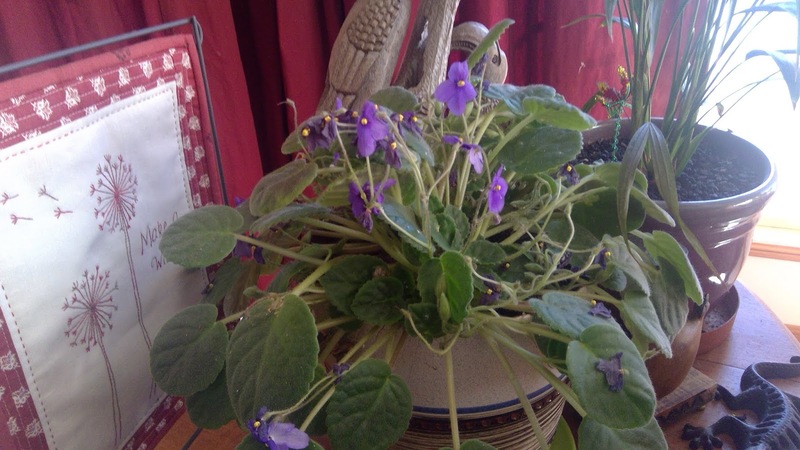 My African Violet is enjoying indoors - I have always had it outside but its loving it's spot with the morning sun. I decided I would like a few more, but they are hard to find at the nursery!!! I think they are too old fashioned. Looks like the painting is moving along. 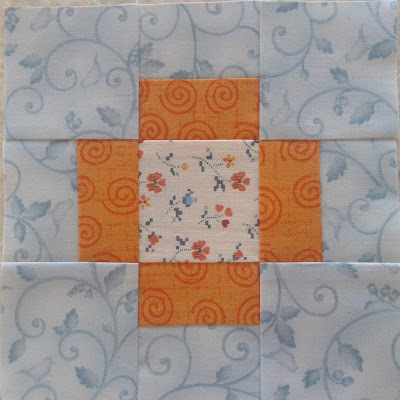 Glad you can still stitch - and garden! The room will look great once finished. Your work is as lovely as ever. I have an African Violet...I think they have periods when they are easy to find in shops, and at other times prove to be elusive. Good luck with the rooting of them. How exciting to get the painting under way. Your dribble bibs are cute. A handy gift to have on hand. Good luck with the African violets. I drowned some last year. I may try again with water well pots. Mum used to grow over ones. Fingers crossed on the African violets, I have never been ale to grow them! 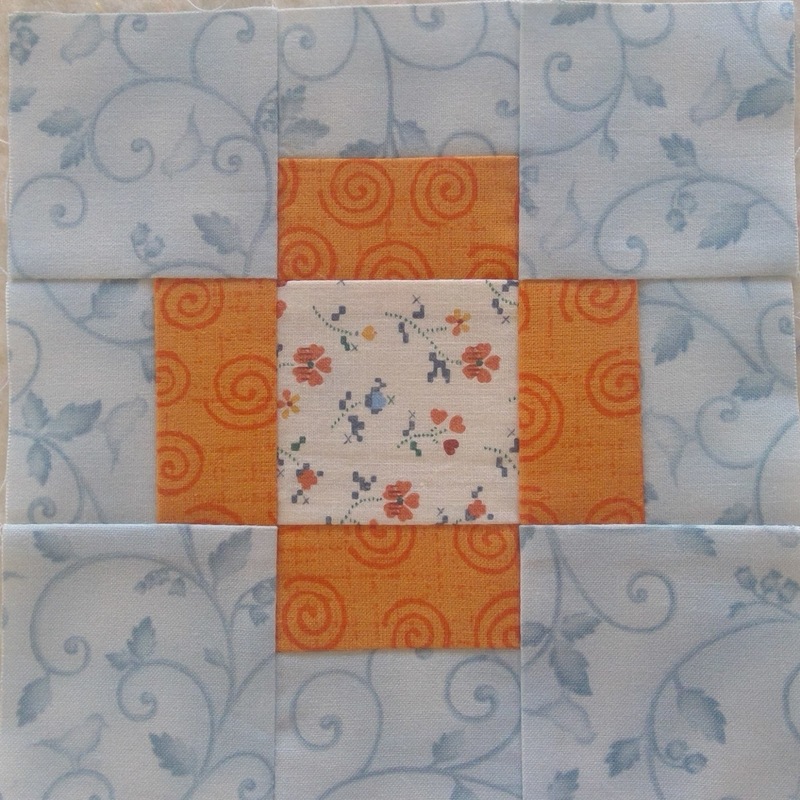 It will be nice to have a fresh new look for your sewing space - should give you plenty of room to display quilts. It will be a love.y bright room to work in Fiona. Lovely Blockheads block.. can't believe how far you've gotten with MSW . Looks great. P.S Good luck with the African Violets.. they're a very pretty plant. Lovely and bright will make a nice change,love your African violets, hope they take. 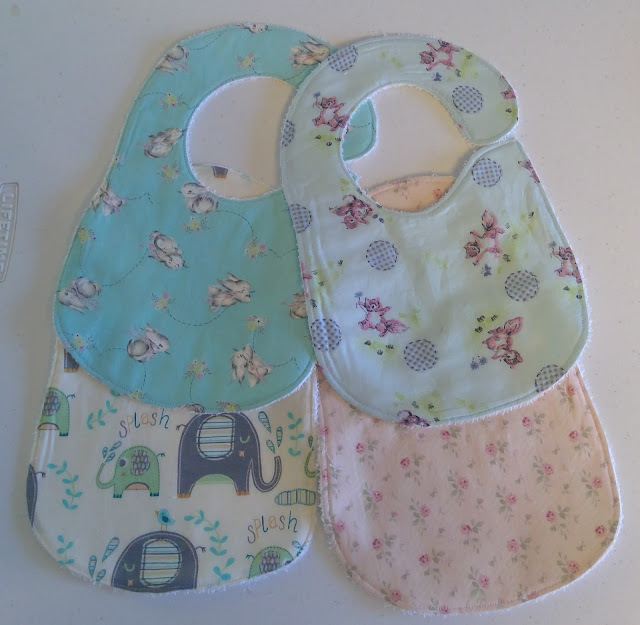 Lovely bibs. Good to see you are supervising while sewing away there!! 😆 bibs are really cute, so many lovely projects under way. 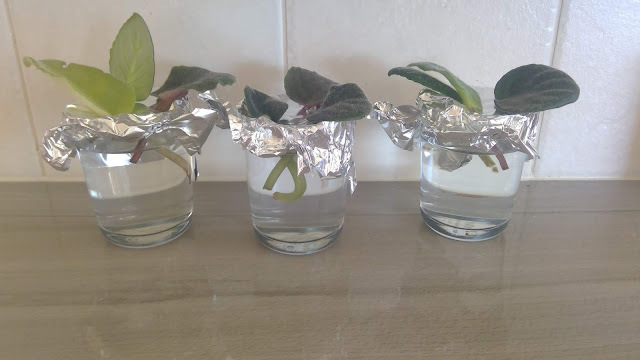 Good luck with the African violets. Oh lovely new fresh paint Fiona... exciting! Then you can have fun re-decorating the room when you move back in. I hope your cuttings take on... I'm no Green Thumb but always like to see the efforts of others with better success. African Violets are indoor plants here (Pacific Northwest) and easy to find. I envy all your beautiful outdoor colorful plants. Yay for brightness - let there be light! Your block is so pretty, and I simply adore My Small World! That vintage fabric for the bibs is incredibly sweet, lucky baby. Your African violet looks so much different than mine - mine are more compact - could it be the difference in sunshine? My grandmother used to have tons of them. We can still find them around here, they're quite popular. I think they should root just fine - how fun!